“Islam is the message!” “The medium is the message!” These two mottos – the former deriving from the modern Islamist camp, the latter from Marshall McLuhan’s classic work Understanding Media – seem as pertinent as ever in the new millennium (McLuhan 1964). As sociologist of religion Lorne L. Dawson puts it in his comment on McLuhan’s motto, “[m]edia are not neutral or passive conduits for the transfer of information. They mold the message in ways that crucially influence the world views we construct. They adjust our self-conceptions, notions of human relations and community, and the nature of reality itself” (Lorne 2004, 385). Hence, if we add ‘Islam’ and ‘Muslims’ to medium, we begin to realize the far-reaching and profound implications of this religious add-on, not only for the academic study of Islam but also for the believers, the Muslims and their communities. Furthermore, we should take into consideration the observation already put forth in mid-1990s that, so Dale F. Eickelman and Jon W. Anderson, “[i]ncreasingly […] large numbers of Muslims explain their goals in terms of the normative language of Islam” (Eickelman 2003, 7). 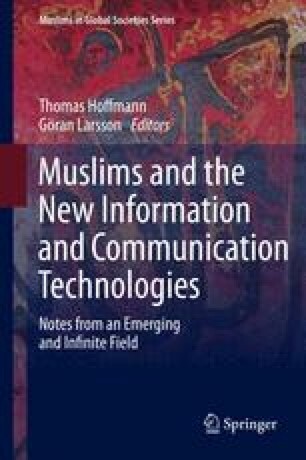 Given that this proliferation is facilitated and moulded to a high degree by New Information and Communication Technology (henceforth ICT), we begin to grasp the relevance of an Islam & Muslim-orientated approach. Various definitions of the term ICT exist, some of which are highly technical, but for our present purposes we use it as the wider term for any communication device or application, which comprises access, transmission, storage, and manipulation of information. Different from what could be called classical ICT, such as books and newspapers, New ICT is characterized by a high degree of digitalization as well as convergence of data-, tele- and mass communication, the latter not necessarily restricted to conventional mass media like TV (stations) or film (industry) but extending into various so-called social media. Alterman, Jon B. 1998. New media, new politics? From satellite television to the internet in the Arab world. Washington, DC: Washington Institute for Near East Policy. http://www.washingtoninstitute.org/policy-analysis/view/new-media-new-politics-from-satellite-television-to-the-internet-in-the-ara. Accessed 22 Mar 2013. Nawawy, Mohammed El-, and Sahar Khamis. 2012. Political activism 2.0: Comparing the role of social media in Egypt’s “Facebook Revolution” and Iran’s “Twitter Uprising”. CyberOrient. Online Journal of the Virtual Middle East 6, Iss. http://www.cyberorient.net/article.do?articleId=7439. Accessed 22 Mar 2013.